DasCoin CEO Michael Mathias is furious over comparisons of his company to OneCoin. Personally I wasn’t aware of anyone claiming otherwise. 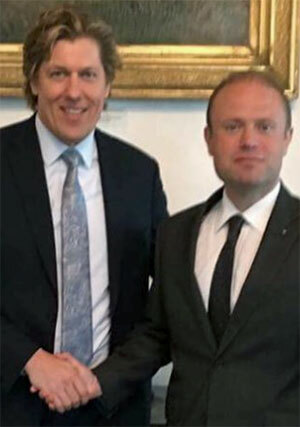 Earlier this year a blurry photo of Mathias with Maltese Prime Minister Joseph Muscat emerged on social media (photo right, with Mathias left and Muscat right). Net Leaders affiliates were quick to cite the photo as proof of pending collaboration with the Maltese government. This attracted the attention of Malta Today, who ran an article covering the story on September 18th. That didn’t go down well with Mathias, who demanded a right of reply. He was given one and the original article was updated to include Mathias’ many denials. Evidently nobody believed him, as Mathias has now filed a judicial protest demanding the article be taken down. Before we get into Mathias’ denials and threats, some clarification. Net Leaders initially launched as Coin Leaders in late 2016. The MLM opportunity sees affiliates invest up to €25,000 in DasCoin. DasCoin are non-publicly tradeable points, purportedly tracked through a non-public blockchain as of March, 2017. How the company tracked DasCoin points investment prior to March has never been publicly disclosed. The only holders of DasCoin are Net Leaders affiliates, and the internal value of DasCoin it set by DasCoin itself. In addition to being paid to recruit new Net Leaders investors, affiliates withdraw a ROI by investing, waiting for DasCoin to increase the internal value of DasCoin points and then cashing out through the internal exchange. On the backend, the only source of revenue entering NetLeaders and DasCoin is newly invested affiliate funds. The use of which to pay Net Leaders affiliates a ROI when they cash out their DasCoin points makes the entire operation a Ponzi scheme. It’s also a 1:1 copy of the OneCoin Ponzi scheme, who pioneered the combination of Ponzi points with cryptocurrency back in 2014. That Net Leaders and DasCoin are modeled on OneCoin is no coincidence. John Pretto, Chairman of Net Leaders, is a former OneCoin affiliate investor. So is DasCoin CEO Michal Mathias. Although for some strange reason he both acknowledges and vehemently denies his prior involvement in OneCoin. I have NEVER been a principal, partner, director, officer, employee and/or consultant of either OneCoin, or any company affiliated with OneCoin. Whilst I did purchase products from OneCoin (strictly as a customer), my first, last and only actual public interaction with OneCoin occurred in July of 2015. As with Net Leaders and DasCoin, OneCoin has no retail customers. Everyone is an affiliate investor. OneCoin’s “products” (PDF and video files) are bundled with OneCoin token investment. Again like DasCoin, OneCoin periodically increase the value of OneCoin tokens. This generates a ROI for affiliates who have already invested when they cash out. It’s worth noting that this is obviously an unsustainable business model, as evidenced by OneCoin suspending affiliate ROI withdrawals back in January. 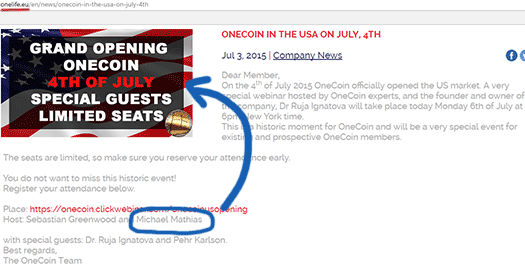 The take-away though is that, for no matter how brief a time, Michael Mathias signed up as a OneCoin affiliate and invested. The statements in the article in question that “DasCoin is an offshoot of OneCoin”; that Michael Mathias is an affiliate of OneCoin, one of the biggest crypto Ponzi schemes”; are completely false with no factual basis whatsoever. Now that you’re up to speed on Net Leaders and DasCoin being a OneCoin Ponzi clone, we can go over Mathias’ recently filed judicial protest. As far as I can tell, a judicial protest isn’t legally binding and isn’t a lawsuit. Instead it’s more of a public protest, typically alleging a breach of law. In the case of Mathias’ judicial protest, it’s also a threat of actual legal action should his demands not be met. In his judicial protest, Mathias is demanding Malta Today retract their article (along with his published right of reply) and issue a public apology. (Mathias) called on Mr Galea to remove the material from the blog and to offer a public apology within two days. He held him responsible for damages. Lawyers Doran Magri Demajo and Kris Busietta signed the protest. I suspect much of this has to do with Mathias, DasCoin and Net Leaders trying to get cozy with the Maltese government. Even if it is true, being called out as a Ponzi scheme isn’t good for business. Neither is being associated with OneCoin, which the Maltese government issued an investor warning against back in April. Given the two companies use identical business models, the Malta Financial Services Authority’s warning against investment in OneCoin could just as easily be applied to Net Leaders and DasCoin. A fact Mathias is no doubt painfully aware of. Rather than explain how Net Leaders and DasCoin are different to OneCoin on a fundamental level though, instead Mathias is threatening legal action. I don’t know what the financial situation is for author Jonathan Galea and Malta Today, but here’s hoping they hold Mathias to task. As I write this neither Malta Today or Jonathan Galea have responded to Mathias’ legal threats. How? Unless a regulator steps in, same thing will happen as it did with OneCoin. Top investors and management take your money and you’re left holding the bag. Mithil if you are unsure please just use the HODL method. dascoin prices are now beginning to grow. ^^ Same garbage OneCoin affiliates have been saying since 2014. And how did this photo come about? Forgery? A photomontage? Two ex-crooks of OneCoin among themselves – at that time in the so-called “EM Power Team”. Today Michael Mathias is cheating with DasCoin.